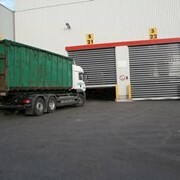 The fastest roll door on the market, this STR Efaflex High Speed Turbo Door is also suitable for strong winds. 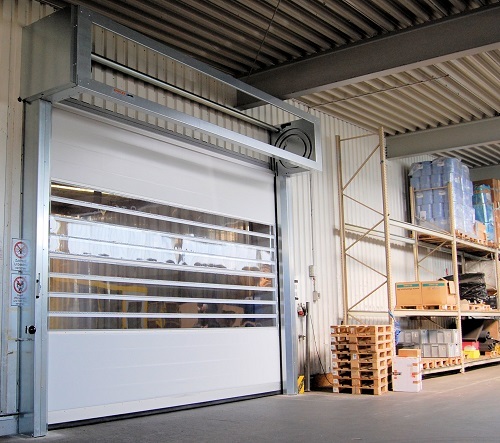 The EFAFLEX High Speed Roll Door STR is one of the fastest doors on the market, with an incredible speed of up to 4m/sec. 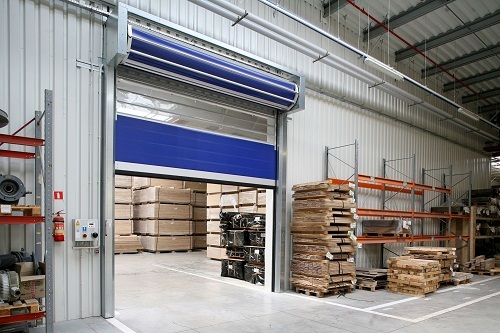 It combines the patented design principles of the spiral type door panel with the incorporation of flexible and variable coloured door curtains. 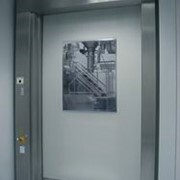 The individual panels are held away from the spiral, therefore practically free of wear. 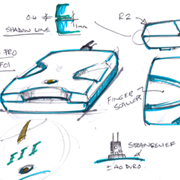 In addition they can be combined with permanently fully transparent sight sections. 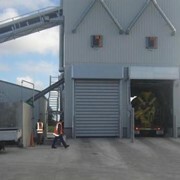 The door panels are produced in a modular manner, so that individual segments can be swiftly and simply exchanged. 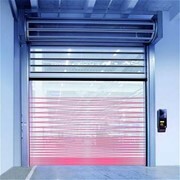 Its high wind stability, comprehensive sealing and a smooth practically wear free door movement, also provides for the highest flexibility of use. 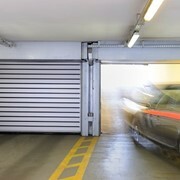 This model can therefore bost not only the fastest, but the best wind capacity fast action PVC door on the market. 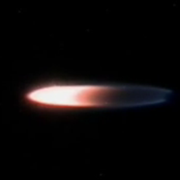 Flexible with absolute wind stability....that is a unqiue combination. 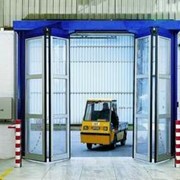 The STR High Speed Door is a high load resistant door system both for internal and external applications. 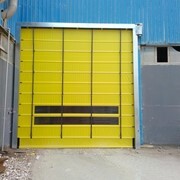 Wind, cold or rain cannot affect this door construction. The curtain is accurately guided at the side, longitudinal expansion is excluded. 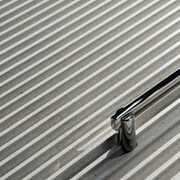 Anodised aluminium profiles strengthen the door panel with vertical component spacings of 225 mm. 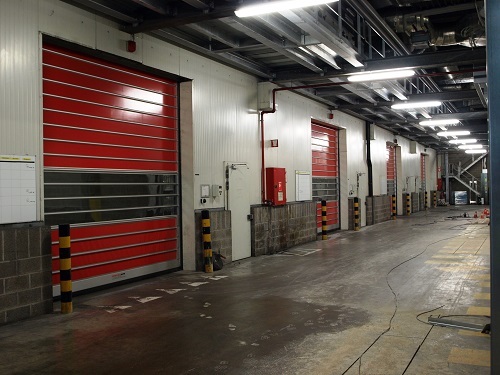 This guarantees an extremely high wind resistance of over 120 km/h (Class 3 in accordance with EN 12424) and an excellent sealing under all conceivable climatic conditions. 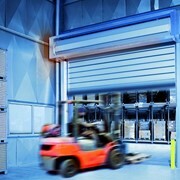 For even greater levels of safety EFAFLEX also employs the door light grid TLG. 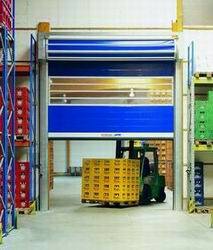 The result is the optimum protection for people, transported goods and the door itself. As an option, the Efaflex STR can have the ACS Active Crash System, with automatic return can also provide additional collision protection to the lower door area. 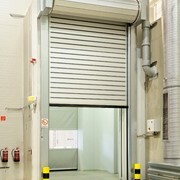 This feature allows the bottom 900mm of the door blade to non destructively crash out of the columns, and automatically realign back into full operation.